The 2.5 gigatonnes isn't enough to trigger a sudden climate shift, but the team worries that other areas around the globe might be seeing a similar destabilization. "It is unlikely that the western North Atlantic margin is the only area experiencing changing ocean currents," they noted. "Our estimate ... may therefore represent only a fraction of the methane hydrate currently destabilizing globally." The wider destabilization evidence, co-author Ben Phrampus told NBC News, includes data from the Arctic and Alaska's northern slope in the Beaufort Sea. And it's not just under the seafloor that methane has been locked up. Some Arctic land area are seeing permafrost thaw, which could release methane stored there as well. "We may approach a turning point" from a warming driven by man-made carbon dioxide to a warming driven by methane, Jurgen Mienert, the geology department chair at Norway's University of Tromso, told NBC News. "The interactions between the warming Arctic Ocean and the potentially huge methane-ice reservoirs beneath the Arctic Ocean floor point towards increasing instability," he added. For thousands of years, permafrost has trapped Siberia's carbon-rich soil, a compost of Ice Age plant and animal remains. But global warming is melting the permafrost and exposing the soil, causing highly flammable methane to seep out. NBC's Jim Maceda reports. He also noted, however, that "one of the big unknowns is the magnitude of rapid methane escape from the ocean floor, and how natural filter systems react and affect the future ocean, its environment and the climate." 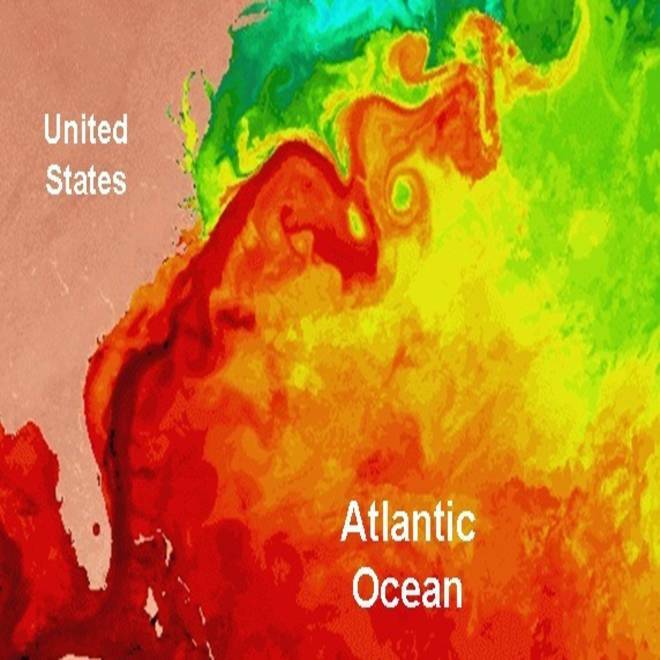 Another unknown is what caused the Gulf Stream changes, said Phrampus, an earth sciences PhD candidate at Southern Methodist University in Dallas, Texas. "Multiple events can play a factor, such as changing sea level or an addition of cold/fresh water from the north," Phrampus said, adding he was hopeful that the changes might be "reversible under their own influence." But, he added, "we need more data to resolve this, and we are currently investigating this process."